Description: Custom Crafted of Solid Brass, Mission inspired straight lines and a peaked roof are depicted as a handsome American Craftsman Signature style. 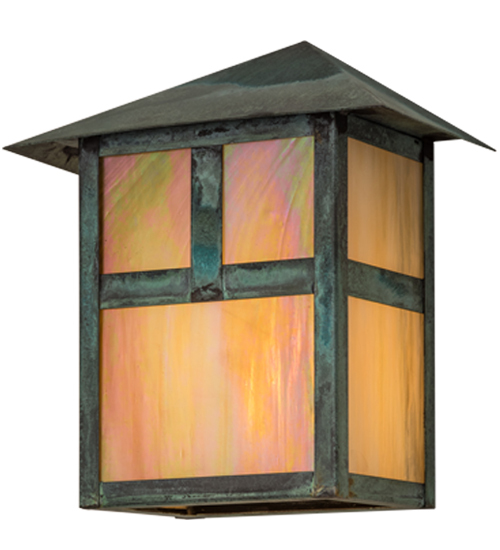 Ambient light projects through Beige Iridescent art glass, which is enhanced with hardware, accents and frame featured in a Verdigris finish. Ideal for indoor and outdoor lighting applications, the fixture is handcrafted by Meyda artisans in the Yorkville, NY manufacturing facility at the foothills of the Adirondack Mountains. Custom colors, styles and sizes are available. Energy efficient lamping options are offered.